No idea what to give the serious ballplayer you know on their big day? Let them choose…give the gift of better batting on your next special occasion with ClubRollers.com Gift Cards! These cards are redeemable for any product or service listed on Club Rollers and will be a surefire hit for a baseball or softball player in your life. They make excellent gifts for birthdays, holidays, graduations or even just because. ClubRollers.com Gift Cards are available in denominations from $50 to $300 to help that special slugging someone own the bat of their dreams, or get one they already own made more powerful than they ever dreamed. ClubRollers.com Gift Cards never lose value, don’t expire like other gift cards, and are a very special way to let a diamond warrior know that you care. 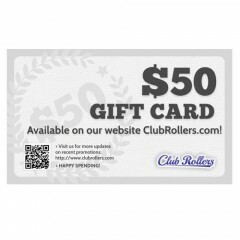 For your next special occasion, get them what they want…get them a Club Rollers.com Gift Card.